Yeah, the beauty in the ugly, suffering, struggling, fearful, doubtful, unclear, unintelligent, weak, vulnerable part of ourselves. 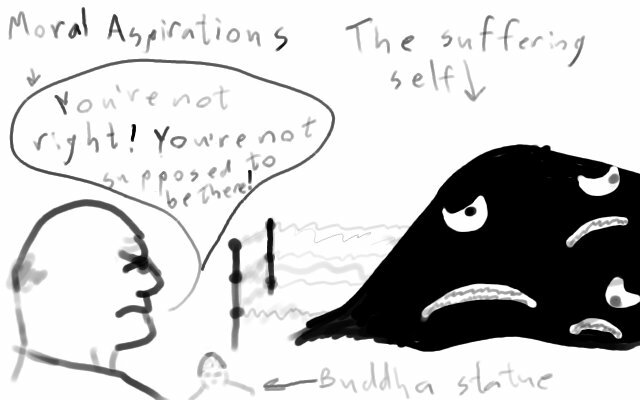 That part of ourselves that’s like a big, black blob writhing in pain. It’s been guilted, shamed, abused, ignored, shunned, denied, and blamed. We might think, at such times, we’re doing the right thing by clinging to our false idols of the “right way”, but you know what, every idol is just a static idea inside the mind, like a statue. And statues can be shattered. Putting away those idols and tending to what’s real is not about “enlightenment”, “becoming better”, or “uncovering the truth”. It’s just simple kindness. Self-kindness. And the recognition that our moral, religious, or philosophical aspirations may just be an excuse to run away from what we’re really feeling. We need to learn to welcome our own ugliness back into our circle of friendship. Back to a place of kindness where it can find some rest, and the freedom to be as it is. There’s always the impulse to change things inside ourselves we find disgusting. But when we see that our idea of how that side of ourselves should change is extremely limited, we can grasp our own abuse of ourselves. Rather than caring for how we really feel, we try to change and fix. Make it “moral”. Make it “good”. Remember: even the side of you who feels ugliest to you has its own beauty. Just look for it. Instead of causing suffering by trying to change it, relieve suffering by freeing it. Don’t you want to relieve your own suffering? You can. But if you think there’s a step-by-step process to it, you’re wrong. You must feel your way to it. Feel the suffering, feel your own impulse to ignore, control, and diminish it. When you feel the situation within you, whatever it might be, as it really is (to the best of your ability), your heart will guide you. You don’t need to figure out what’s good or bad before you get somewhere. Doing the right thing doesn’t follow a plan. It emerges from your feelings. So follow what you feel to take you towards the right course of action. It will show itself at the right time. This entry was posted in Insights and tagged ambition, aspirations, beauty, control, denial, false idols, morality, pain, self-kindness, soul, strife, struggle, suffering, ugliness by Oliver Kaufman. Bookmark the permalink.